Jorge Lorenzo managed to keep his title hopes alive with a brilliant ride to victory in the Japanese MotoGP race on Sunday. The win means that he cuts Marquez's lead down to 13 points with one race to go. This was also Yamaha's 200th victory in the premier class and ironically it came at a Honda owned track (Motegi Circuit). In fact in all of the practice sessions it was the Hondas that set the pace. Lorenzo's amazing turn around was down to an inspired tyre choice. And right before lining up on the grid the Yamaha rider opted for the extra soft Bridgestone tyre when everyone else was on the harder of the two tyre choices on offer. Out of the gates Lorenzo took the lead and never relinquished it, crossing the line 3.5 seconds ahead of Honda riders Marquez and Pedrosa. Valentino Rossi had a lackluster end to a promising weekend when he ran off track at turn eleven on the third lap and dropped from second place to eleventh. He later did manage to claw his way back to finish sixth. Pedrosa's third place finish means that his title hopes are over this year, leaving just Lorenzo and Marquez battling for the championship title. The way the points stand at the moment Marquez will just need to finish fourth or better in the last race to clinch the title. Pol Espargaro managed to wrap up the Moto2 Championship for 2013 winning a dramatic race on Sunday. Having come into the weekend just 16 points ahead of Scott Redding he needed a good strong race to maintain his lead going into the final round. But a crash involving Redding, Esteve Rabat and Alex Marinelarena brought out the red flag and the race had to be restarted. Both Redding and Rabat were unable to make it to the re-start and this meant that Espargaro just need to increase his lead to over 25 points to take the title. Pol Espargaro could have easily cruised to a seventh place finish but instead led the race from start to finish lifting the crown in style. Marc Marquez's brother Alex Marquez took the first win of his Moto3 career wining a tough fought battle with Maveric Vinales. But it was behind the first two finishers where all the drama was. Title contenders Luis Salom and Alex Rins both fell in separate incidents allowing Maverick Vinales back into the hunt for the championship. 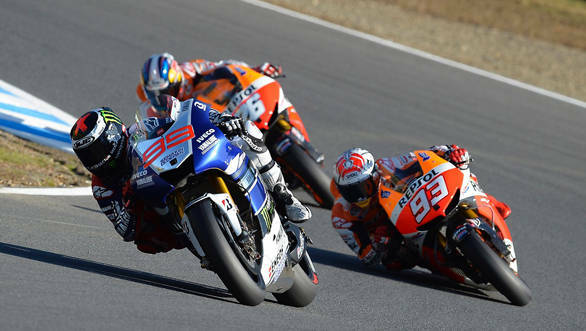 With the top three separated by just five points the season finale in Valencia, Spain should be a real cracker.